Will Enns art Studio in Summerland presents - A collection of paintings of well known jazz musicians, amazing golf art, leading edge digital illustration, magazine cover art, and much more! You may know we were heading off to Italy. The flight was to write home about, which is why I am writing home about it. Air France was amazing. They served champagne to everyone who wanted it, and breakfast at 3 in the morning. I can only imagine first class would make me want to write twice. On the 9 hour leg, I got stuck next to this guy (let me get a breath of air here...) This was a fella with body odor so thick you could spoon it, although I can't imagine why you would want to. Every few minutes he would lift his arm to wipe sweat off his forehead with his forearm. Lord, have mercy. Lord... have mercy. Here we are, in the heart of Tuscany. 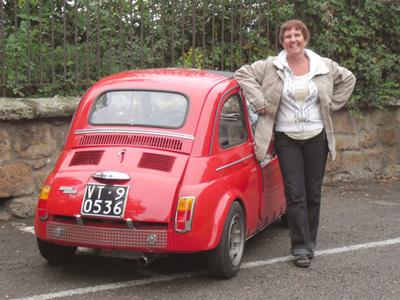 Italian cars are skateboards modified with engines. Pretty zippy skateboards, too. But you don't dare drive in the left lane of the Autostrada, no sirree. You have got no business in that lane if your skateboard can't do 160kph. If you get caught there, some attitude encased in a Beemer is going to chew your bumper off, then start in on your body parts. The working guys drive the tricycles. You never see those guys drive in the left lane. I reckon they tried it and that's how they came to have 3 wheels. Note the role cages. In the attached photo, I am hangin' out with the guys. 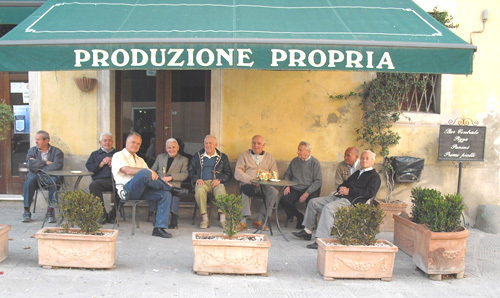 It's what us older fellas do, here in Tuscany after about 6PM. It was pretty interesting conversation for those of us who could understand Italian. I know, 'cause they were all laughing. Today we went for coffee, which we ordered in Italian. What we got was, a dollop of paving tar topped with a shot of grappa. Had no problem with dozing on the drive home. I was so awake it was several hours before I could blink. Had to keep the pedal floored just to overcome the sense of slow motion. I now understand why the Italians all think anyone driving the speed limit is either dead or a tourist. Next we visit the Cinque Terre (pronounced Chinkwa Terra) where there are 5 villages perched on cliffs within walking distance of each other. A fella in decent shape can walk the entire stretch in about 4 hours, which means it shouldn't take me more than 12. Riomaggiore, where uptown and downtown can be in the same building. We stayed in Monterosso, one of the villages of the Cinque Terre. 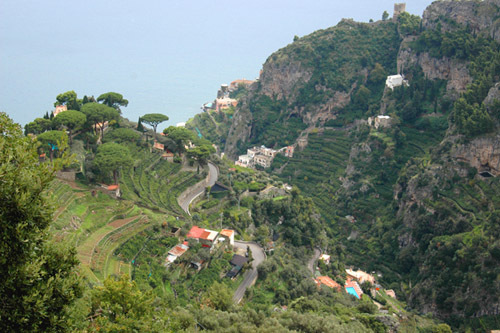 The drive from Tuscany to Cinque Terra was an eye-opener or an eye closer, depending on the viewer's idea of "fun." 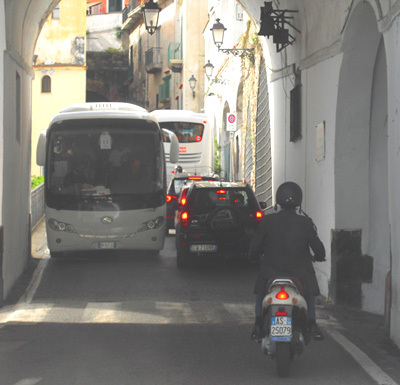 Traveling from the A1 (Italy's version of a freeway) to Monterosso requires the use of a secondary road which a kind person might describe as serpentine. This person would be lying. In reality negotiating this road is more akin to untangling a ball of yarn the cat has played with for several years. I have only heard that the scenery was spectacular since this driver's eyes were fully occupied by the road and taxi drivers who are more gifted than we Canadians. These villages all are restricted traffic zones. This means you park your car above and take a taxi to your dwelling. These taxi drivers routinely hold their mobiles to their ears, shift gears, carry conversations with several people in two languages, and warp their cars around the impossible curves all at the same time. I have seen some impressive juggling acts, but never one that involved my own life in such a direct fashion. We had an apartment there for a week. The apartment is 400 square feet. The bathroom is a short hallway where you squeeze sideways by the shower before you can back up to the toilet. 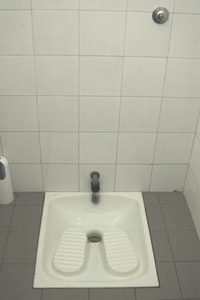 But no matter the lack of space, they still find room to install a bidet. Our first night was marked by a downpour that would daunt a fish. We were going to have dinner outside, but even the restaurants gave up on that idea! We went shopping for food daily. Monteroso has no supermarket. You buy the various elements of your planned meal from different vendors. The pasta is fresh, made that day. Ravioli, tortellini, spaghetti, pesto etc., all fresh. Anything you buy is wrapped by the vendor in paper and taped shut, just like our own butchers used to do. It would be quaint if it were not so sad that we once also enjoyed such personal service before the invasion of the box stores. The butcher provided us with comic relief. Jennifer pointed to a slab of meat and asked what it was. The butcher made an incomprehensible reply, which of course we failed to comprehend. So I said " Ba-a-a-a?" He shook his head. I said :Bak bak bak?" he shook his head again, but held his arms about 2 feet apart. "Goobla goobla?" He nodded vigorously and we had turkey for dinner. We are getting pretty good at Italian. The Cinque Terra is a national park which includes five villages strung out over about 10 kilometers of rugged coastline. 1% of it could be described as level, but only by an optimist. One day we walked the trail from Vernazza into Corniglia. The trail consists of a set of stairs several times the height of the sears tower, with a similar flight going down the other side. The stairs were relieved at intervals by mud puddles left by the aforementioned downpour. Jennifer remained staunchly unimpressed by both the stairs and the puddles. 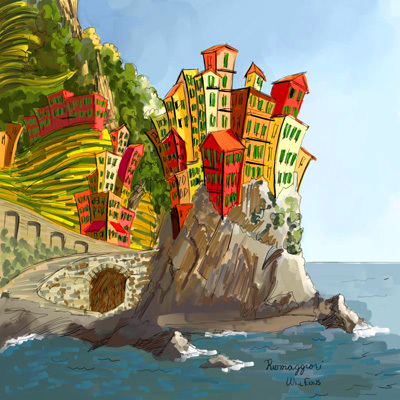 Wednesday we walked the Via del Amoure, the Lover's Walk, from Riomaggiore to Manarola. This is a spectacular paved walk that takes 1/2 hour to navigate. 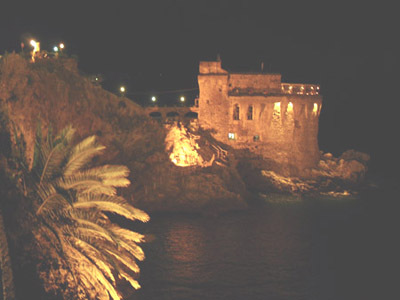 You can look along the coastline from points, and see the other villages perched on the cliffs. Thursday Jennifer rented a beach chair and umbrella. Here, you rent the equipment for the day, and it is always available for you. The beach police chase off any squatters who may have taken possession while you were chasing down a gelato. Cost: about 12 Euros for 2 lounges and an umbrella. 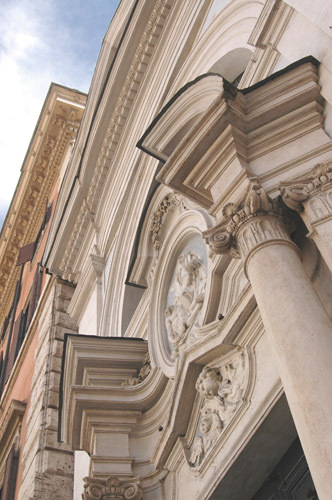 We spoke to an English lady who lives in Italy. She said it cost 1000 Euros ($1300) to heat a typical dwelling for 2 months in winter with gas. This accounts for the laundry we see hanging under nearly every window. Our apartment has a washer, this is the dryer. Trivia: In Italy you have to show your passport before you can buy internet time. If you hate stairs, don't come to the Cinque Terre. In this picture you can see the stairs go up several stories. The door on the right is someone's front door. The handrail on the right doubles as a gas line. All the utilities and services are bolted to the outside of the buildings because many of them are more than 1000 years old. We rented a Fiat. Ok, I admit it's a motor scooter with 4 wheels. 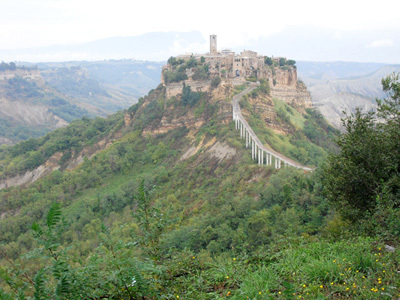 Civita de Bagnoregio. If you can say that 3 times in one breath without getting your tongue tied into a sailor's knot, you are a certified Italian. We had lunch in Civita de Bagnoregio. The restaurant was offering a 'tourist's menu,' which included 1/4 liter of wine, bruchetta drenched in olive oil and cooked over live coals, prosciutto, sausage fried in olive oil, vegetables pickled in olive oil, potatoes grilled under a drizzle of olive oil. The wine was like all wine we have tasted in Italy: Oaky, with a built-in sphincter muscle. We have established this is necessary to make digestion of the olive oil possible. I chased it all with an espresso to calm my stomach. It is forecast that Mt Vesuvius will not blow today. There is not so much as a trace of volcanic ash on the breeze, so we set out for the ancient ruins of Pompeii. If there is such a thing as a magnificent ruin, Pompeii is it. Acres upon acres of partially collapsed dwellings; a roman coliseum almost perfectly intact; temples to the great gods of Rome (an astute observer might observe they were missing the god of common sense); remarkably well preserved art still intact upon the walls of those ancient dwellings; plaster casts of ancient pompeiians hunched over upon themselves as they contemplated the certainty of their demise. In spite of it all, Jennifer cannot resist a kitchen. These people had the good stuff. Marble countertops, built in sinks, wood-fired ovens, etc. ad nauseum. Those wood fire ovens account in large part for Italy's superior pizza. We saw no dishes, which clearly explains why they didn't have dishwashers. Pompeiians had gods for pretty much every occasion. This painting of Venus survives on the wall of a villa there after all these years. It is in about the best condition of all the art we saw in Pompeii. 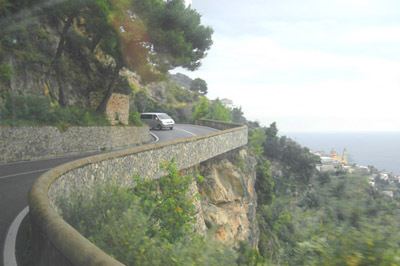 The Amalfi coast road stretches from Salerno on the east of the peninsula to Sorrento at the west end. It is variously carved out of, or suspended from, sheer cliffs. It offers views of the Mediterranean Sea that compare with nothing in my experience. It is only 50km long, but took 150 years to build. The speed limit is 50kph, but even the Ferraris don't go that fast. There are too many tourists in the way who have not girded their loins with absorbent material. They keep the pace down to a sedate 20 kph. Today we drove that road. It is the first time in 30 years I have enjoyed driving. While I am adequately prepared, all 10 of Jennifer's fingerprints are permanently impressed in the door handle of the Fiat. I hope Hertz of Rome doesn't penalize me for this. As you can see, 2 busses passing here are as likely to smear paint on each other, as not. I talked with one guy who has ridden the bus a lot here. He said the drivers often drive with their left hands dangling out of the window, and touch fingers as they pass each other. Strange fellowship these bus drivers have. On this road, many policemen direct traffic because normal rules of the road do not account for the tight spaces. On one occasion, our guy saw the driver exit the bus, and after arguing with the policeman, the driver directed traffic until his bus was clear, then got back in the bus and drove on. Below you can see how the road is cantilevered out from the cliff. 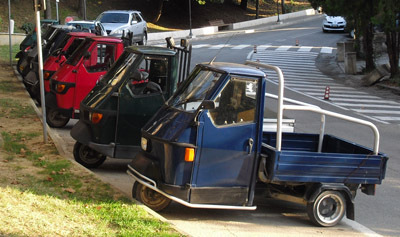 Italians have unparalleled parallel parking skills. No Canadian I have met could park in this spot. The bumpers were touching at both ends. This is the 30th anniversary of the day I asked Jennifer to marry me. We decided to splurge. We counted our Euros, and the Euro cents, too. Based on this research, we reasoned that the restaurant housed in this ancient defense outpost would be just within our reach. "Would you like some water?" "With gas, or not with gas?" "No gas, no gas please! We had gas earlier, didn't like it so much." "OK, naturale water, with no gas." "Could we have carbonated water please, I think you say 'frisante?' "
"Si Signora! Water, with gas! No problem!" So went the ordering process. First course was Vellum of Beef Shank. I did not know it was possible to slice beef so thin you could see the plate through it. Second course was breast of Cornish Hen stuffed with Smoked Mozzarella. The wine was a Rose that rivaled my home-made. Desert was 3/4 bottle of Limoncello Cream we still had in our room. It is thought by some that this is the spot where Satan brought Christ to tempt Him with the beauties of this world. On many sunny days, it is impossible to tell where the sea ends and the sky begins. Villa Cimbroni's view of infinity. Trivia: my research indicated that Italians dress up for all occasions. This example makes me glad we have not encountered any casual dressers. 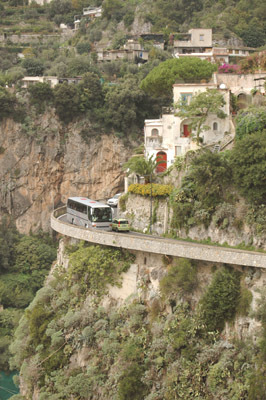 As one follows the paved goat trail from Amalfi toward Rome, one is greeted by this spectacular panorama. Pompeii is in the middle distance, Vesuvius beyond, and Napoli (Naples) in the distance on the left. Driving through this congested maze brings its own challenges. Roundabouts here often consist of nothing more than a pot of flowers placed in the middle of a badly designed intersection. Even Phillipe (as our GPS has come to be known after the movie Beauty and the Beast, in which the king asks his horse "where have you taken me, Phillipe?") got confused and guided us to take one-way streets against the flow, and to turn into streets that were blocked off years ago. After being wrong several times, he stubbornly refused to give any more instructions until I found my way to the edge of this witch's cauldron of traffic. The toll highway was a welcome relief, and I would have paid twice the price for the structure it provided. Our first stop in Rome was the coliseum, where we were in the first tour group to ever visit the lower level. The coliseum is thought to have seated up to 60,000 spectators. The high wall at the right once extended all the way around at that level, with seats extending to the top. There was a canvas awning on poles to protect spectators form rain and sun. On the left you can see a small area where the marble seats have been restored. The floor where the people are standing has been reconstructed to give a sense of the original structure while allowing a view of the sub structure, which housed gladiators, wild beasts, and provided the passages where the various life-threatened contestants could be introduced to the arena for the entertainment of the spectators. We used up all our luck that day, the day before our flight home. After our visit to the coliseum, we were contemplating the rest of the day when Nunzia sat down next to Jennifer and asked how things were. 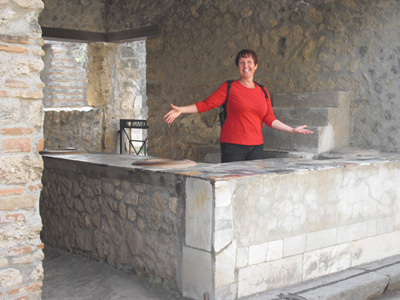 Jennifer explained that we were planning to throw our remaining cash at a bus tour to get an overview of Rome. Nunzia counseled us, "Mamma- mia, it's-a very expensive-a, and-a you don't-a need to spend-a the money-a! Walk-a with me-a!" Every word punctuated with expansive hand gestures. She spent the next 5 hours gesturing around central Rome with us. It turned out she was a tour guide who had done her work for the day, and chose for some inexplicable reason to spend the balance of the day with us. She was the friendliest person we met in Italy. 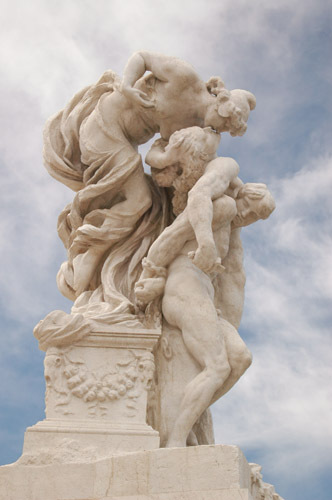 Magnificent marble sculptures are literally everywhere. It is a roman custom to build a fountain at the termination of any aqueduct. 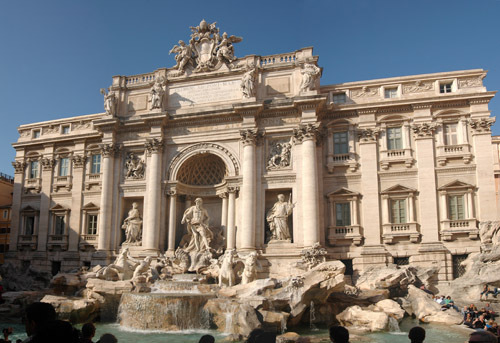 Trevi Fountain was commissioned by Pope Clement in 1732, completed 30 years later. It is said that if you throw a coin over your shoulder into this fountain you will one day return the the eternal city. We will see. As of this time, I am skeptical. The trip home was a marathon of stress, hereafter to be known as "The Great Traviata." The aforementioned luck gave out when the taxi dropped us off at the wrong terminal. Fortunately Leonardo Da Vinci airport is only a few miles end to end, and we gasped and galloped to the correct departure point just in time to wait a while. At DeGaule airport the French were complaining about their official retirement age and reinforcing their point by withholding gasoline from some flights. After our eventual takeoff, the flight staff graciously kept refilling our champagne glasses, which made the next 9 hours giddy, but did nothing to recover the time lost by missing our connection from Seattle to Spokane. Finally, we arrived home after being wired on adrenaline for about 28 hours. My body still thinks I am in Rome, and wants to go to bed in the middle of the afternoon, then follows up with a wake up call at 2AM. The pastor need not be shocked if I snore through his sermon. It would not be a commentary on its content. I will reserve that for some time when he is paying attention. Now, I say arrivederci. This will be my final report of our European vacation. I trust you have not found my recounting too stressful.